The Greatest Show on Earth: Penguin, 452 pages, ₹ 499. Every unapologetic fan of Hindi cinema knows that the magic doesn’t begin with those few restless minutes in the dark theatre before the opening credits roll in, or end with “The End". The love affairs, the myths spun around heroes and heroines, the exaggerated quirks, the past, are integral to this love. It’s not enough to love Dharmendra the screen god; you need to know how drunk he was when he pleaded with Hema Malini not to marry Jeetendra a day before the marriage was to take place. The real life stories, interpreted and reinterpreted, matter; they add to the delicious myths. Some gems from the book, divided into six parts (The Stars, The Films and the Film-Makers, The Music and the Music-Maker, The Gossip, Ringside Views, The Fiction): Vinod Mehta is smitten, an unapologetic fanboy, when he writes why only one role, that of chhoti bahu in Sahib, Bibi aur Ghulam, could do justice to Meena Kumari. Rachel Dwyer writes on the founding of Yash Raj Films, Mumbai’s romance factory. Manto writes on the sexual prowess of Sitara, “the dancing tigress from Nepal". Vijay Anand’s Guide is seen from two views—by Dev Anand, its star, and author R.K. Narayan, whom the film seriously offended. And there is Nandy’s absurd and riotous encounter with Kishore Kumar, The Man from Khandwa. While reading the book, I called up Nandy to ask what he remembered from that interview. “It was the first time I was meeting Kishore Kumar. There were no introductions before that day. I went with disrespect, just with questions I had to ask him. There was no adulation for who he was and I think that is why it went the way it did." Kumar was a genius, Nandy says, who respected people who did not go with the purpose of praising him or asking the boring, politically correct questions. Who gets subjects like Kumar in the age of mindless, over-oiled public relations? 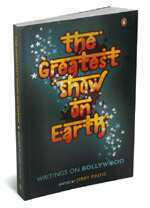 The Greatest Show on Earth is a book that is strictly the antithesis of the majority of Indian film books available in the market—glossy, hagiographic coffee-table tomes. If you like your cinema, these are interviews and essays you would like to revisit, recount and pass on to your young cousin or granddaughter.